Before cities vied competitively for the creative class of young professionals, Charlotte could boast such a group. The Charlotte Society of Communicating Arts (CSCA), was a professional organization of art directors, illustrators, photographers, writers and supporting vendors that played an active role in the creative vibrancy of Charlotte for decades. One of the organization’s yearly highlights was its annual pig roast – where pork and creativity joined forces for a day of food, fun, and fellowship. 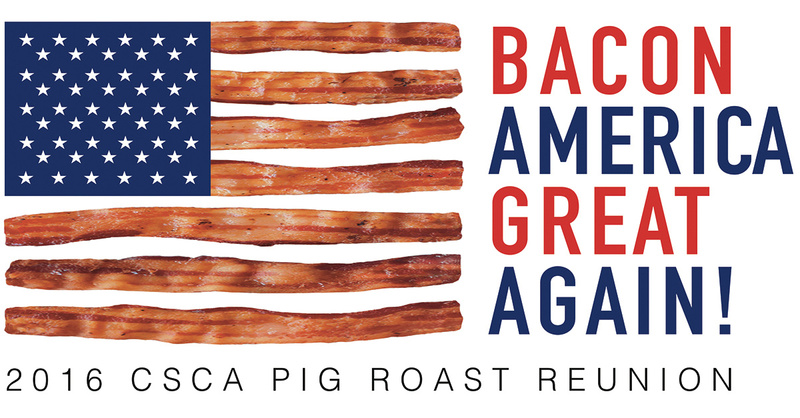 For our June APA Charlotte members social we’re teaming up for: Bacon America Great Again: 2016 CSCA Pig Roast Reunion! For $35 you get a generous plate of bbq with fixings catered by Midwood Smokehouse, a Bacon America Great Again T-shirt, organized fun and games, unorganized goofing off, a celebratory bonfire, optional overnight camping, and the rousing rock-n-roll stylings of Grievous Angels and The Burnouts. APA Charlotte will cover the cost of any current APA Charlotte member’s ticket up to $35. You purchase your ticket and eMail (forward) a copy of your PayPal receipt along with your mailing address, and APA Charlotte will reimburse you. Tickets are on sale now. All sales end June 1. Your PayPal receipt is your ticket to the event. Print it out and bring it with you. Click here for location, more info, and tickets! This entry was posted in Events, News, Upcoming Events and tagged events, Pig Roast, social networking. Bookmark the permalink.